Red Beets are not a very popular vegetable, but they have moved up a couple of notches during the past year. There are many ways to use red beets, but for the Eastern European cooks, the ever famous Red Beet Borscht is one of the more popular dishes prepared from red beets. Red beets salads are very often used as a side dish with the main course meal, in many Polish and Ukrainian cuisines. Red Beets Vinaigrette (Burachky – in Ukrainian, or Cwikla – in Polish) is also a very popular way of preparing red beets, and one of the “must have” foods for the Easter Basket Blessing for Easter Brunch. 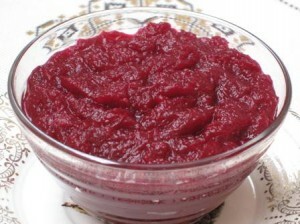 Horseradish with red beets is also part of the Seder meal at Passover. For those of you who do not care much for this vegetable, the Red Beets Vinaigrette might be the way to win you over. Here is my recipe for Red Beets Vinaigrette, which is included in for my Easter Basket. Rinse the beets, trim off and discard, the stems, leaves, and the thin roots. Place beets in a medium size pot, fill with cold water (enough water to extend a couple of inches above beets). Bring to boil, and cook until beets are soft when tested with a fork or toothpick (about 20 minutes). Drain off the water, and let beets cool off. Peel the beets (the skin will slide off very easily). Grate on a fine grater, or puree it in a food processor. Cover and refrigerate overnight (suitable for storage for a week or so). Taste it again before serving, you might need to add more vinegar or horseradish for a more piquant flavor. Do you use plain white vinegar or white wine vinegar for the red beet vinaigrette? Also is it OK to use 3 tsp horseradish cream for this recipe as I can’t get anything else? I use plain white vinegar, but I am sure white wine vinegar would be good as well. You might need to add a little more or less, to your taste. I have never used creamed horseradish, but I can’t see why not. I would think it is not as strong as the plain one, so you might need to add a little more of it, to your own taste. I love this with pork! I am sure you will do well. You can add more or less of vinegar and horseradish, to your own taste. I am not sure if you are looking for a poppy seed roll (yeast raised dough), or actual poppy seed cake? What kind of perizhky are you thinking of, please? I would love a recipe for the ukrainian poppy seed cake and the ukrainian poppy seed yeast roll too if possible. I would love a recipe for both meat perizhky and cabbage perizhky. Your recipes are soooo wonderful and I am really trying to learn about Ukrainian food, its sad my mum is Ukrainian but never learnt to make these dishes from my baba who is sadly no longer with us. I want to preserve Ukrainian culture with my family. I love reading your comments. You sound like such a sweet person, who is reaching out to learn about her Ukrainian roots, which is so awesome. Since I only post the recipes I tried myself, I will have to make these foods, take pictures, and then post them. I will do this after Easter sometimes, and continue with more of my family favorites, so if you have signed up for email, you will be receiving all my posts that way, and one of these days see the recipes you are looking for. I will continue posting, but since I work full time, I can only cook, bake and take notes and pictures on weekends (providing I have some free time), so please be patient with me. Thank you so much for all you kind comments. Enjoy your Easter! Thanks yes I will totally keep my eyes peeled for all your fabo recipes in the future. I am so looking forward to more of your yummy food! You are a great sport! Keep on reading, and will definitely keep on posting.